Dr. Qazi Kholiquzzaman Ahmad, Chairman, PKSF, visited ENRICH programmes in Rajshahi and Natore districts from 23 to 25 April 2016. During the visit, he has participated in the inaugural ceremony of `Development Fair and Health Camp’ held in Baneshwar Union under Puthiya Upazila of Rajshahi district, organised by the Partner Organization, Shataphool Bangladesh. Mr. Md. 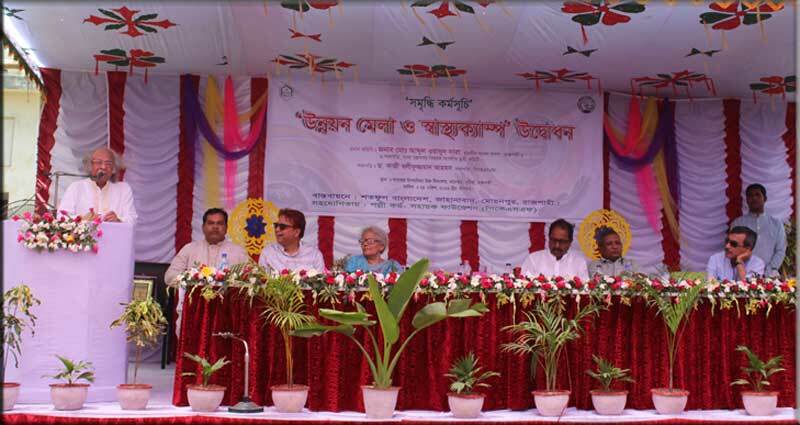 Abdul Wadud Dara, Member of Parliament, Rajshahi-5 and Chairman of the Parliamentary Standing Committee on Ministry of Food, graced the occasion as the Chief Guest. Enriched homes and interventions under education, health, nutrition, community development were exhibited through 17 stalls. Besides, a Health Camp was organised where a total of 565 patients received free medical services. Nearly 1500 persons visited the fair. Further, Chairman PKSF inaugurated a goat breeding farm and a training course under LIFT Program of PKSF. He has also visited the activities of ENRICH programme at Murshinda Union under Gurudaspur upazila of Natore district implemented by a Partner Organization named National Development Programme (NDP). Dr. Md. Jasim Uddin, Deputy Managing Director (Administration) of PKSF accompanied the honorable Chairman during the visit.